Beloved Chilean poet and politician Neftalí Ricardo Reyes Basoalto – otherwise known as Pablo Neruda (1904–1973) – helped design this quirky, nautical-themed home for himself and his third wife, Matilde Urrutia, for whom La Chascona (“tangle-haired woman”) is named. Bursting with Neruda´s odd collections and romantic personality, the house serves as unique insight into one of the most important figures in the country´s recent history. Music boxes, exotic artifacts, original chinaware, toys, antiques, and an overwhelming library with thousands of books are only part of the appeal; also on display are a replica of his Nobel Prize (presented in 1971 for literature) and a portrait of Urrutia by the famous artist Diego Rivera, which holds a secret of its own. Though later vandalized by dictator Pinochet´s men, La Chascona has been restored and is now open to the public via tours (English included). La Sebastiana in Valparaiso and Casa de Isla Negra in Isla Negra, Neruda´s other two homes, are also preserved and maintained as museums revealing his life and obsessions. Although Pinochet outlawed the observance of Neruda´s funeral, thousands of loyal Chileans filled the streets in his honor nonetheless. After a walk through La Chascona´s bizarrely enchanting chambers, visitors will easily understand how the passionate writer and dedicated communist could continue to inspire people for generations. Photo courtesy of Pekka Parhi via Wikimedia Commons. Poet and Nobel laureate, Pablo Neruda has a special place in Chilean national heritage. 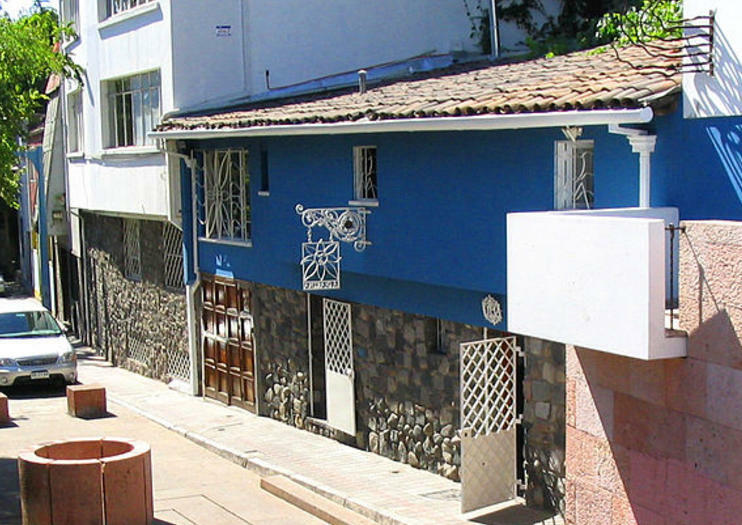 Get a deeper understanding of his life and legacy than would be possible from just reading by visiting his Santiago home, named “La Chascona” for his curly haired mistress Matilde Urrutia. As you stroll through the house, admiring Neruda’s fascinating belongings, your multilingual audio guide fills in the details. Get a street-level view of Santiago’s historic sites, neighborhoods, and parks on a small-group bicycle tour for one to seven people. This full-day Santiago tour follows bike paths, park lanes, and city streets, all equipment, and a visit to the Chilean National Museum of Fine Arts. Getting off the beaten path to explore Santiago’s hidden gems is best done by bike, where you can see, smell and touch the wealth of the markets and interact with the locals. A visit to La Sebastiana, Pablo Neruda’s Valparaíso home, offers not only the opportunity to immerse yourself in the life of Chile’s Nobel laureate, but also to admire sweeping city views from its prime hilltop location. As you explore the house, with its many wings and collection of personal possessions, your audio guide fills in the background information. Our Green Team has fine-tuned this tour since we started in 2008, always striving to make it better tomorrow than it was today. That is the commitment we make to you. This is one of our newest tours and we truly believe in it’s purpose and future success. This is a different way to see Santiago than looking from outside on a bus. We get deep into the nitty gritty and won’t miss a spot. This is the most complete full day experience in Santiago. It includes the 4 main reasons why tourists come to Chile: Wine, Culture, Nature & Gastronomy. Also we aim to create an experience that is inmersive, by going out with small groups of no more than 15 people, this way we make sure everyone gets the best of what this city has to offer.